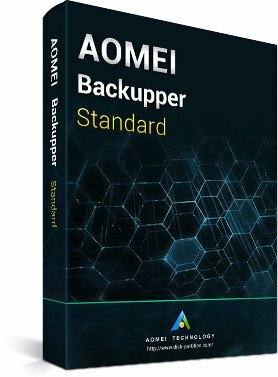 AOMEI Backupper Standard is a free backup software designed for Windows PC. You can protect all data on computer via system backup, file backup, file sync, etc. As disaster recovery solution, this software will help you restore Windows and files after disaster ASAP. It is also free disk cloning software for upgrading HDD to SSD. All operations can be done with no technical skills or knowledge required. Backup or sync files to external drive, USB flash drive, SD card, NAS, network share, mapped network drive, etc. Many types of common backup features offered. Decide what to backup and how to run the backup task based on your own needs. Make an exact copy of all contents in system drive, including Windows operating system, applications and custom settings without interrupting your work. Backup important files/folders such as business documents, photos, projects, or videos to external hard drive, USB flash drive, NAS, network drive, etc. Multi-backup files/folders. Backup all kinds of hard drives, such as internal disk, external disk, USB flash drive, SD card, hard drive on NAS, and other storage devices that can be recognized by Windows. Backup only specified partitions or volume instead of the entire disk to save time and effort. Backup multiple partitions to a compressed image file. Based on a full backup, this software will backup only changed files with incremental or differential strategy to save backup time and destination storage. Set up a schedule to automatically backup system and data, especially for users who want to create backups at a lesser frequency or have multiple backup schedules. manually or real-time synchronize files/folders under a schedule to local disks, external hard drives and removable USB flash drives. It automatically invoke the tray notification icon to show backup or sync progress if users close the main window, and then continue to perform backup or sync task in the background. Easily and quickly return system to its original state as well as ensure system bootable after recovery. Quickly restore files and folders that are lost, deleted or corrupted, or restore to an earlier time from backup images. One-time recover the entire hard disk drive, or partition to their previous state; no need to recover individual items one by one. Selectively restore individual files or folders from a backup image file instead of recovering the whole backup containing what you do not want to restore. Clone a hard drive to another (HDD/SSD) without creating an image file. Support clone from large disk to smaller. Similar to disk clone, create an exact duplication of your partition or dynamic disk volume to a new partition or a new hard drive. Mount a backup image as a virtual partition so that you can browse its contents in Windows Explorer; Check backup’s integrity so that you can restore it successfully. Create a Windows PE or Linux bootable CD/DVD disc, USB drive or ISO file for system reboot during disaster recovery. Other network cards have been integrated into PE to help you restore image from network share or NAS. Boot computers in LAN from network by using a micro system image (WinPE/Linux ISO/customized image). After booting, you can backup, restore, or maintain those computers. Export backup tasks to a safer place; when they are needed, import them in. View logs to find out what’s going wrong during the operations to help to solve problems. It enables to send an email to your mailbox informing the result when the backup or the scheduled backup is complete. It provide Hotmail server and Gmail server as email SMTP modes. Compress backup images with an industry leading compression algorithm to save storage space. Edit backup task name or the image saving directory. Add comments for different backup contents so that they can be easily identified when it’s time to restore. Intelligent Backup only backup the used sectors to reduce image size and backup time. The following chart describes features and availabilities of different AOMEI Backupper editions. Compare and choose the right edition for your Windows. The "Lifetime Free Upgrades" license ensures that you're entitled to upgrade for FREE to any later new versions that we release after you buy. No annual billing or renewal cost. The license also includes free perpetual technical support. Note: If you uncheck this option, then it is the "Current Version" license, which is only 1-Time purchase without free major version (e.g. from 4.1 to 4.2 or higher) upgrade protection. In such case,you need to pay additional fee to upgrade the current version to each later version. Command line backup Backup, restore, clone command line prompt or by creating scripts. Merge backup imagesCombine full backup and its chained incremental backups into a single backup for better management. Backup disk space managementAutomatically delete old backup images based on specified value to save backup disk space. PXE boot toolThe maximum number of client-side computers allowed to use the PXE network booting service provided by server-side computer. Event-triggered scheduling backupsAutomatically perform backup tasks in real-time based on user logon, user logoff, system startup and system shutdown. Backup and sync data in the background Automatically invoke the tray notification icon to show backup or sync progress if users close the main window, and then continue to perform backup or sync task in the background. License typeOne license code can be used to register the program on the maximum number of computers. Furthermore, AOMEI Backupper is supported in Windows (XP/Vista/7/8/10) and Windows Server (2003/2008/2011/2012/2016) in both 32-bit and 64-bit which is definitely a bonus for either server Administrators at businesses or home users. Complete and easy-to-use backup & restore software for 2 PCs. All-in-one partition software & hard disk manager for 2 PCs. Both support lifetime free upgrades to every latest version. Stable and robust data protection & disaster recovery solution for a single server. Powerful and magic hard disk partition management tool for 2 servers. Both support lifetime free upgrades to very latest version. A maintenance agreement ensures that you will free receive all updates and new versions that are released after you buy.